Bizarre footage shows the moment a man from New Jersey faked a tumble in a bid to rake in some insurance money. Unfortunately for 57-year-old Alexander Goldinsky, it doesn’t look like Quentin Tarantino will be on the blower any time soon. Putting it nicely, this would-be scammer would benefit from a couple of amateur dramatics workshops. The footage shows subcontractor Goldinsky ‘sneakily’ chucking some ice cubes on the floor of his place of work, before orchestrating a throughly unconvincing slip. 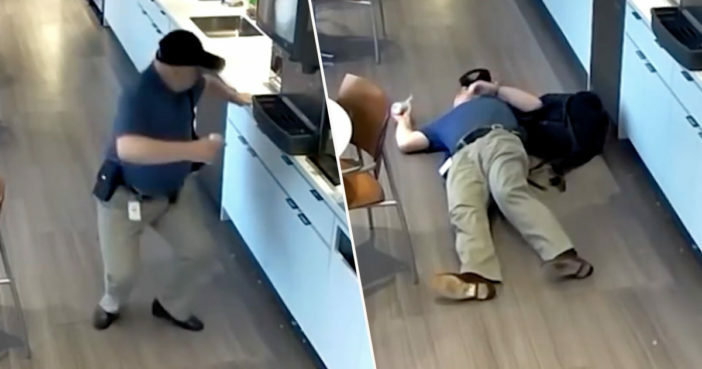 The investigation revealed that Goldinsky purposely threw the ice on the floor in the cafeteria at his workplace, placed himself on the ground and waited until he was discovered. Fraudulent claims cost everyone, and we will aggressively prosecute those who illegally manipulate the system. Yes, I was brought to the police department, […] I didn’t do it, it was a mistake.